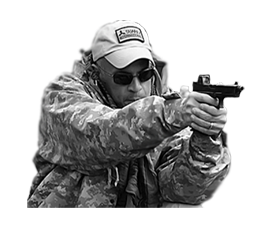 We offer a service where we will zero and inspect a customer's weapon. I also make it a practice to zero every custom pistol or pistol package that leaves HQ. So once a week I load the Company Tahoe with targets and ammo and head off into the weeds of the AZ back country. It is a great time for me as i am away from the office and the sometimes daunting CEO duties that tend to weigh during the week. This last outing once I was done with filming and a few personal training drills I brought out and zeroed each pistol. Shop Monkey had also given me a Glock 43 we had installed a Shield RMS on that the customer had issues zeroing. "Hmm. OK, no worries", I thought. This will be an easy finish. I set up a new target...loaded up the 43 and - BAM I had an AD. I call them AD by the way, not the popular self-flagellating ND because many times it really is the weapon. The AD went right where I was aiming which was gratifying but it was unintentional. I unloaded and tried the trigger a few times dry. This thing had what I surmised as a two pound trigger!! No wonder its owner could hit anything...he was ADing every single shot! I reloaded and fired a group, and the RMS was already zeroed. One slight adjust for windage and it was "eyeball accurate". But that trigger was totally unsafe and unsatisfactory. As soon as I got back to the shop I advised Shop Monkey and the staff that there was no way on God's earth this pistol was leaving the shop with that trigger. Yes, I know...it was not my gun...but it had been through my hands. There is a time when you have to tell a customer "no...that is stupid and we will not do it, nor approve it". This was one of those times. The culprit? As usual - excessive polishing of internals and an aftermarket connector. The gun went back zeroed, with a factory 5.5 pound connector. That its owner was actually carrying this...on the street...in a pocket is why, as the saying goes, we cannot have nice things. Look...would you be happy driving on the road with a car that had no brakes? Or with one whose owner had loosened the steering wheel? I will bet you would not. And if that driver was unable to stop and flattened a handful of first graders on their way to school, along with it being a total tragedy, it would in fact be his fault. Can you imagine this guy with a 2 pound trigger - on a Glock 43 being startled by a thug and touching one of the instant his finger sought the trigger - and missing the thug - and hitting a vital part of his reproductive system…or an innocent? I am not a "skills only" guy, but I am also not a "gear builds skill" guy either. I believe good gear allows good skills to grow. But a two pound trigger is not good gear. A two pound trigger is stupid. Our triggers for example, retain all safety mechanisms on the pistol as I suspect every aftermarket trigger out there does. That is until the end user (after watching some nimrod on YouTube) begins to make it better. 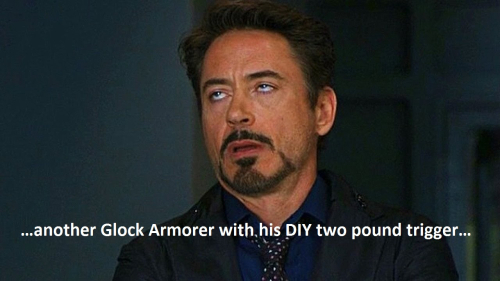 "But I am a Glock Armorer", is what we hear. Look...the only actual requirement to being a Glock Armorer is that your body temp must be above room temperature and you can print your name. Every single trigger problem I have seen has been because some "armorer" decided to polish and/or tune the trigger mechanism. I am actually beginning to miss the days of SIG and HK when nobody ever touched their weapon’s internals out of fear. No. Leave the surfaces alone. The Glock will never be a 1911. If you want a 1911 go and get one. Glocks are different. They can be made very good with aftermarket parts, but before you carry it either have a pro assemble it...or have a pro verify everything is correct and safe. Excessively light triggers are stupid triggers. If your Glock trigger is less than 3.5 to 4 pounds it is not to be carried for combat and only a fool would do so. I can see that one day...as CCW becomes a national matter, that foolishly "tuned" triggers will lead to carry weapon inspections just like they exist on motor vehicles.